brinnnggg Good morning. How may I help you? Mom? I’m really sick. I have tonsillitis. I need to see a doctor. Can you take me? Like he had to ask? My “mom instinct,” quiescent for the last couple of weeks, went instantly into overdrive. I was at #1 Son’s front door in less than 20 minutes, and at the Urgent Care Clinic as quickly as I could drive there (our doctor had no available appointments). Mom I want to see the doctor! Now! They’ll get to us as soon as they can, kiddo. The doctor said that it was definitely tonsillitis and she’d be right back with a prescription. Why is it taking so long? I want to go home. I feel lousy. I want to lie down and sleep. Where’s the doctor? I’m sure she’s hurrying as fast as she can. When the doctor returned, #1 Son asked when he could go back to work. Not for a few days, but she’d write an excuse for him. I want to go home. I want to lie down. Why is it taking so long? It can’t take this long to write an excuse! I left #1 Son at home (my home) with the instructions to go eat some ice cream or something else cold, and headed to the local Albertsons. Dropping the prescription off with the pharmacist, I shopped a bit: Ice cream, Popsicles, milk, yogurt, 7-Up. And I remembered kitty litter. That always pleases the furry kids. A lot. The kitty litter box was slit. Box knifed, it looked like to me. 21 lbs of kitty litter were now on the floor under the cart in a pile. 21 lbs of kitty litter make a big pile. Captain Kidd would whack out and hide under the counter. We wouldn’t be able to find him for days. He would neither eat nor use the litter. Phoebe would start shedding like mad, meow loudly at everyone and then join Kidd under the counter. She would come out that night to use the litter, and might stay out if she found a cushy spot to nap — like maybe curled up on a loaf of bread or two. The chicken in the deli would be breakfast, lunch and dinner. Moo Cow would curl up on top of the pile of litter and demand attention, petting and treats from every shopper and every employee. No one would be able to enter or exit the store without first kowtowing to Her Majesty. The chicken, beef and ham from the deli would be hand-fed to her by her adoring public. I told the clerk that it would probably be better if I just took the litter home to the cats. On the way home I gave up all thoughts of making it to Tangle for Thursday opening knitting night. It appears that the fates conspire against me. But I will make it one of these days! I have to admit that I had a sneaking little mote of a feeling of satisfaction that my son, who has been oh so grown up the past few months, could still still need his mom every now and then. These were started on our trip to the coast last Sunday. #1 Son egged me on a bit. That’s cool, Mom. I like those colors. Use more of that. But I have no one to blame but myself. OK. That’s my story and I’m sticking with it. 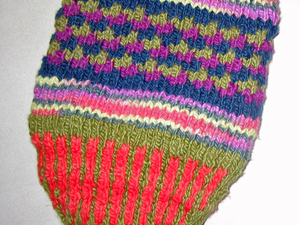 Click on the pic to see the progress on both socks of the pair. I can hear my sweater even as I type: Only a few more rows! Only a few more rows! But I won’t be wearing a sweater for a couple of months. I’ll get back there, after a pair of Fixation socks, or two.